Anyone please suggest which contraint combination is best for getting this desired output. It must be suitable for both iPad and iPhones. First I set the label To in the center of the container and set contrainst for all other controls based on that. But the problem is there are lot more space left and the design looks not good. I would have one Horizontal UIStackView with Distribution Fill Equally and inside I would put two horizontal UIStackViews with Distributions Fill. Inside each I would put UILabel and then UITextField. 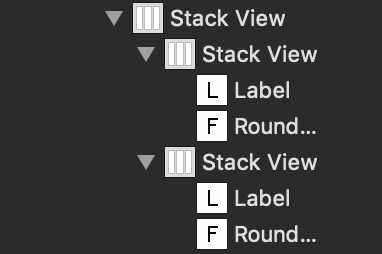 So, constraints which you need are constraints for main stack view. Not the answer you're looking for? Browse other questions tagged swift autolayout or ask your own question. How should I design this in auto layout? What's the best approach to support iPad and iPhone in my App?